Pam Bermingham grew up in Scarsdale and saw her parents play on the Cogswell court. She started playing at the Manursing Island Club in Rye, NY, and made it to the finals of the Women’s Nationals in 1958. A year later, she found herself living in Sewickley, PA, with no real chance to play. She and her husband, Eldredge “Wooley” Bermingham (Hall of Fame 1979), changed that and she set about teaching and promoting the game. Her zeal and enthusiasm were instrumental in developing a vibrant paddle community, with active leagues and junior play, and formed the base for one of the” hot-spots” in the country for the game. Bermingham became a paddle missionary after she and Wooley (Honor Award in 1979 and Hall of Fame inductee in 1996), moved west to Pittsburgh. She got Pittsburgh women and their husbands to come to clinics, and encouraged local women to travel and play outside the region, and those outside to join her within the region. None of this would have been possible without her zeal to teach, her infectious enthusiasm for the game, her desire to get people who knew the game to strive for another level, and those who were content at their level to realize how much fun it was to play. A “quality player” and a fine teacher of the game, her former partner and long-term friends Anne Jackson and Bam Behrer noted that the true testimonial to Pam’s success as a player and teacher was the number of her former students from the Sewickley area who played in the Nationals the year she was inducted into the Hall of Fame (1997). 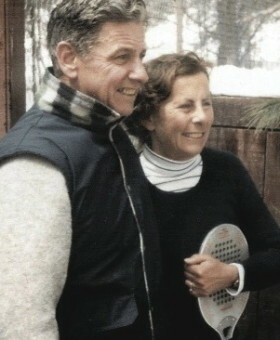 In 1959, Pam and husband, Wooley, moved to Sewickley and introduced the game of paddle tennis to their newfound friends. 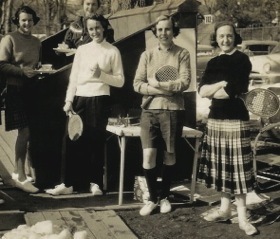 The Berminghams engendered enough enthusiasm for the sport that the Edgeworth Club board approved the plans for building a paddle court in February 1962. A second court was added by the fall of 1964 to accommodate the increasing popularity of the game. While raising six children, Pam devoted many daytime hours to teaching the game that she grew up with as a resident of Scarsdale. With her playing and teaching partners, Jenny Scott and Anne Jackson, Pam took her paddle on the road to conduct beginning to advanced clinics throughout the Midwest and as far west as Lake Forest, Illinois. At home, she devoted her time teaching in the Saturday morning clinics for beginning junior players started by David Schaff at the Edgewort Club, as well as teaching the advanced players how to improve their consistency and strategy. She set up junior tournaments to provide youngsters the competition they needed to elevate their levels of play. Her enthusiasm and affection for the sport did not stop with teaching the youth. Pam was equally tireless teaching women and other who had never played racquet sports before picking up their first paddle in one of her clinics. She also initiated women’s interclub and league divisions, enabling players of all ability to enter into the fun and competition of the popular winter sport. By 1970, the beginnings of a paddle explosion emerged as paddle courts had already been built in Fox Chapel and Upper St. Clair Country Club in the South Hills. Pam and Wooley were receiving calls from these paddle enthusiasts to demonstrate how the game was played. Through these exhibition matches—in Sewickley, Fox Chapel, South Hills, and at Oakmont Country Club, where the first two aluminum courts were built in 1971—players multiplied by the dozens. Witnessing the increasing popularity of the game, Wooley laid the foundation for the Western Pennsylvania Platform Tennis Association. 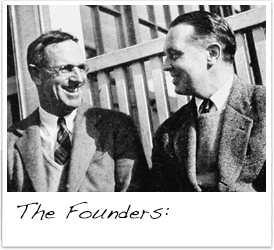 The organization served as a model for other associations that have formed since—the Middle Atlantic Platform Tennis Association for the eastern seaboard, and the Western Platform Association for the West Coast. At the time of Pam’s induction, there were seventeen clubs and public parks participating in men’s and women’s WPPTA interclub competition from September through March. There were seven divisions in the women’s league and four divisions in the men’s. An evening league, with two divisions, had been added in the 1992-93 season to accommodate the increasing population of working women. In recognition of his contributions to the growth, development and administration platform paddle tennis, Wooley, more formally known as Eldredge L. Birmingham, received the Honor Award in 1979, and it was fitting to recognize the immense contributions of both Bermighams as the development of the game in Pittsburgh was truly a team effort. Wooley and Pam Bermingham. Wooley received the APTA Honor Award in 1979.